To find out what personal data the Society holds about you and how we use it, please refer to our Privacy Notice. The Society will never sell your personal data, nor share it with another company or charity for marketing purposes. The Bulletin has been given a new look, with a new editorial team of Ken Sankey, Jenny Pateman and Martin Leech. Recipients of the Bulletin will now become Friends of the Canal, a community of people and an information hub for all those who enjoy the Canal and want to safeguard its future. The Bulletin is available on-line and is free. The first edition was first published in late 2010. There are currently over 1500 subscribers/Friends, mostly from the UK, but a small proportion are spread worldwide. Subscription management and email distribution are handled by a package called YourMessageListProvider (YMLP). Back numbers of the Basingstoke Canal Bulletin can be found below. No 39: March 2019: David Horwood, Spring on the cut, Bringing an old wharf back to life, Water – where to find it, A bit of history, Volunteer spotlight. 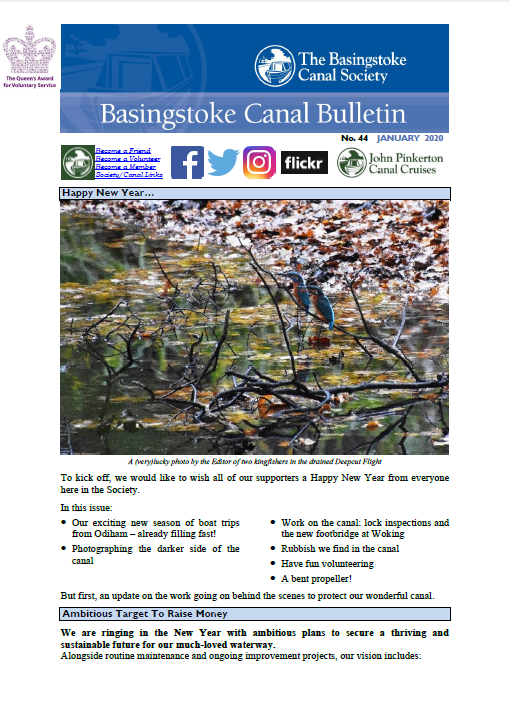 No 38: January 2019: New Year’s Resolutions?, Crookham Wharf refurbishment, Have you booked your boat trip yet?, Health and Wellbeing, A Day in the life of a lengthsman, Water Strategy team request, Birds on the Basingstoke, How the Canal Restoration Started. No 36: September 2018: Photo competition and Canal Calendar for sale, Queen’s Award for Voluntary Service celebrations, Inaugural Odiham Raft Race, Our and About, Focus On: GoodGym Woking, More on Invasive Species, A Bit of History – King John’s Castle, And Finally…. 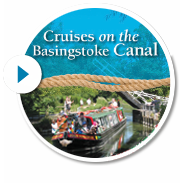 No 33: March 2018: Friends Initiative, Book Your Boat Trips, Keeping the Canal Open and Working, Society QAVS Nomination, Volunteers Required, Basingstoke Canal Canoe Club, Canal War Defences, And Finally…. No 30: May 2017: Kitty Trip Boat Operation Launches; Kitty trips announced and on-line booking available; More about Kitty; Work Party activity. No 24: Aug-Nov 2014: Monitoring Water the Hi-tech way, Work Party Activities, Dogmersfield Landslip works commenced, Duckweed in Woking, John Pinkerton news, other news, forthcoming events. No 23: May/June/July 2014: A New Addition…, Busy on the Basingstoke, Progress with Canal Centre Redevelopment, Some progress with Dogmersfield Landslip, Canal management changes, Work Party Activity, John Pinkerton News, Forthcoming events. No 18: Mar/Apr/May 2013: Deepcut Flight Now Open!, Dogmersfield Landslip, Margurite Redway, JP II Has Arrived, JP II Naming Ceremony announcement, Reflections on the Easter Cruise. No 1: Nov 2010: Structural repairs, Volunteering News, John Pinkerton News, About the Bulletin.